I love Portland. It is a magical land of eats, microcrews, hikes and no sales tax which activates the inner consumer in me. Stuff, for LESS? Yes, count me in. 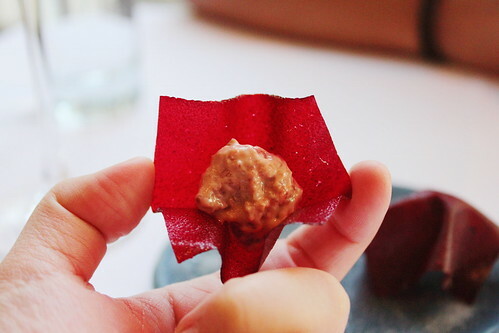 Beet chip with foie gras cream. Creamy and crunchy. Please sir, can i have some more? 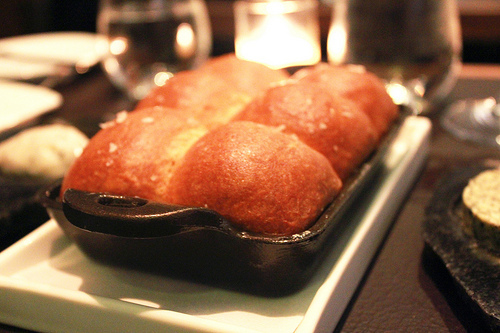 Their house made bread comes with two spreads – smoked pork lard and butter. I enjoyed slathering these different spreads across the warm wheat rolls. As to which one was better? That’s a hard one (and still can’t answer that question). This is what they described as an “adult version of a fruit roll-up“, which was very good and unfortunately did not note down what was in it. I’m ashamed, mostly because I can’t properly describe how tasty this was. 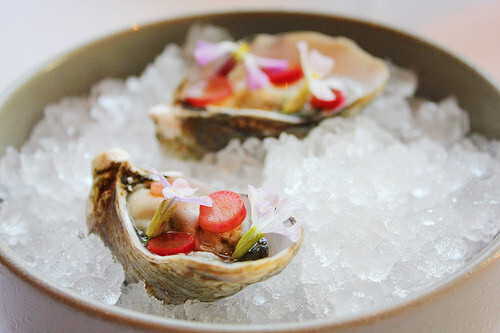 Oysters so beautifully plated, and tastefully balanced. 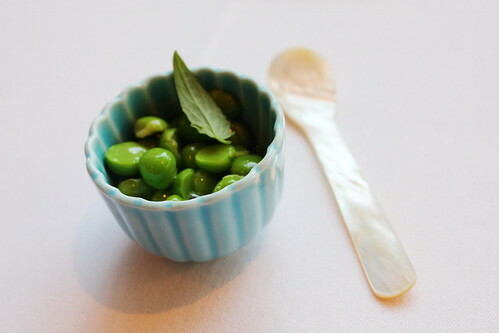 Peas, agastache and goat’s butter served in a small porcelain cup and a mother-of-pearl spoon. Was it as delicious as described? Hell yes, and every bit as luxurious as you’d think too. 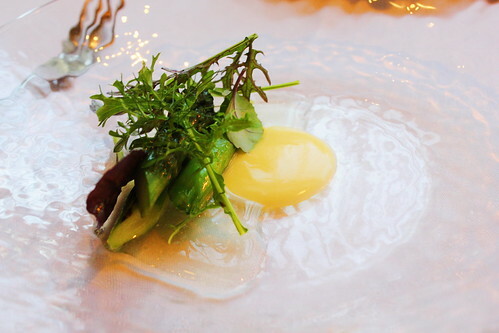 This egg-looking dish is actually centered around asparagus, reminding you of the spring time. 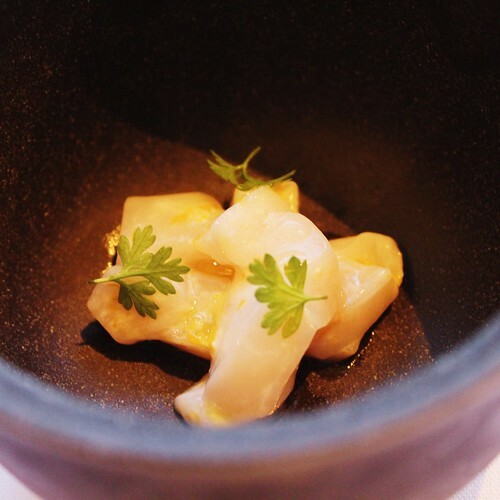 Okay, I know this isn’t the best photo of what a scallop is, but this is a marinated scallop indeed. 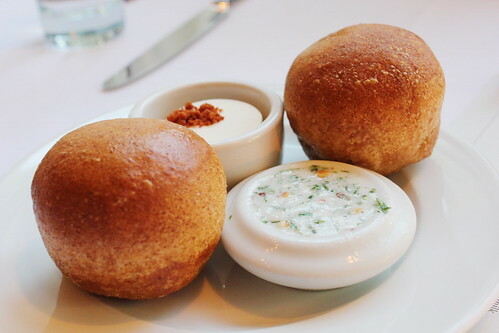 A few bites, and wish I had a bit more to be able to evaluate my feelings for the dish; it was fresh and mildly sweet. Beet with black garlic powder and maltaise (aka hollandaise sauce), which was one of my favorite dishes of the night. 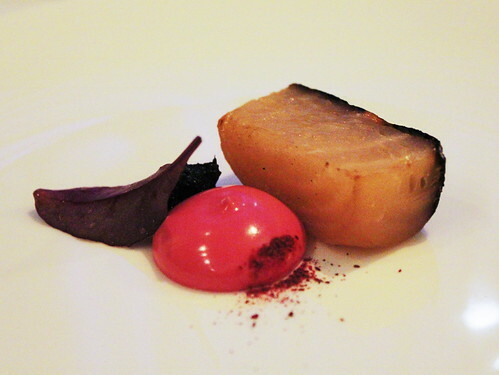 Not only did the beet feel meaty, but also melded with the sauces and dust. 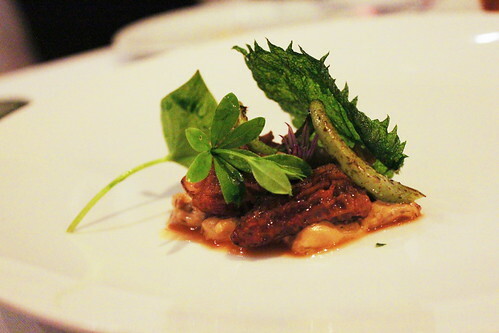 Morels with fiddlehead fern, and a few other beautiful things. 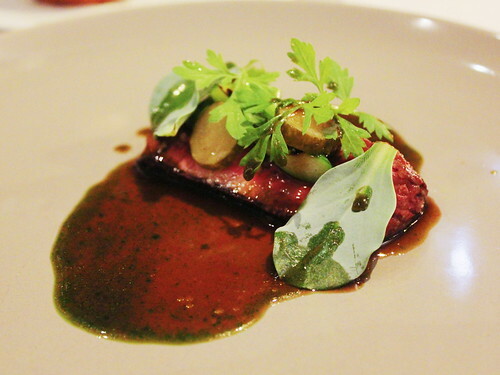 Earthy and rustic, a small bite of something slightly heavy easing into the next course. 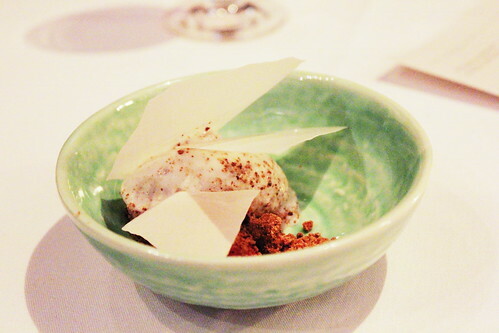 Culotte with oyster leaf was sadly, the only point in the night where I wasn’t satisfied. 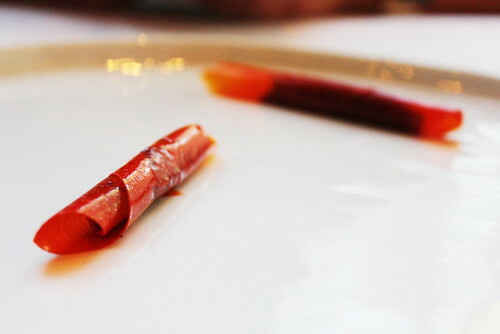 The meat was chewy, but not in a very pleasant flavorful way, which took away from the other parts of the dish. 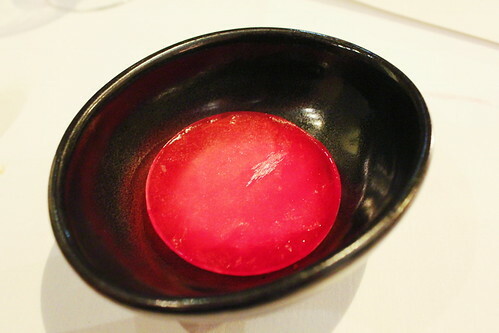 Another one of the most impressive dishes of the night was the frozen rhubarb with black olive and vanilla sitting underneath. 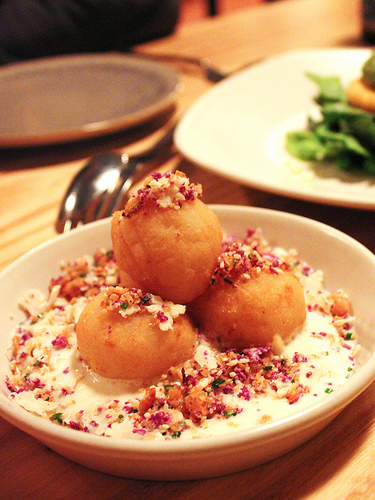 The combination of these flavors and textures made me come alive, and wonder for the next 30 minutes how this exact dish was formulated…and I’m still wondering. Toast with strawberries and milk makes the last official course of the night, and what more comforting than those ingredients. The sharp-edged milk shardes poking into the strawberry ice cream and toast crumbs left you feeling like you can sit back and relax in ease, like giving out the last hug of the night. 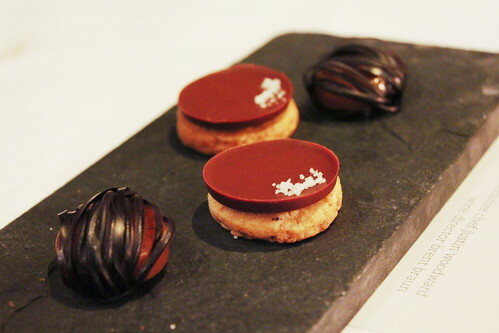 Chocolates rounded out the night, with hazelnuts and sea salt. Who could say no to that? Castagna plays around with seasonal ingredients, using different textures and preparation methods to have you think twice about each dish. Each bite makes you ask more – the whys and whats – and that’s what I love to do when I eat. Let curiosity flow, and enjoy your full blown thoughtful dining experience there.